There are many things that go into the concept of “composition.” Composition is a defining characteristic that separates a forgettable snapshot from a photo that has a strong impact on the viewer. It’s more important than mega-pixels, more important than what equipment you use. This will be the first in an ongoing series to try and demystify this pretentious-sounding subject and show you how thinking about composition, even a little, can help you improve your photos. We’ll start with a few basic concepts and some guidelines you can follow that will help you start creating images with impact and that draw the viewer in. What is composition? Simply, composition is the arrangement of elements in the frame so that they form a harmonious whole. I think most people have a natural understanding of what a good composition is. You don’t need to be an artist to know when something looks good. The trouble is that most people haven’t even heard of composition. They only know what they’ve been trained to do since they first picked up a camera: make mugshots. So, let’s try to unlearn what you’ve learned from owner’s manuals about making photos. The frame is the area we have to work with. With 35mm cameras (SLRs) it is a rectangular shape with a ratio of 3:2. In most digital compacts it’s more squarish with a ratio of 4:3 (uncoincidentally, this is the same shape as most computer screens). This is your canvas. Everything you want in your photo must fit in this frame. And, just as importantly, everything you don’t want in your photo must be outside of it. Aha! Here’s our first clue about composition. You can decide what is in the photo and what is not in the photo. The elements that make up your photo are your subjects, the background, shapes, colors, lines. Everything in the frame is an element that can be arranged somehow. Everything? Yes! Of course, some elements can be physically moved. But even the sky, even the earth, everything can be arranged. You can include as much or as little of any of these elements as you wish simply by tilting the camera, changing your angle. You may choose to make an image with a sliver of ground and a huge area of sky or vice versa. You might choose to let them share equally. The moon and stars can be moved to any point in the frame with a turn of the wrist. You have absolute control. Hey, that’s great, you’re thinking. I can control the universe. Now what? Armed with this knowledge, the next time you pick up the camera, really look through the viewfinder and notice things. With most photographs, you are trying to show one subject, one idea. Unclutter the frame, simplify. Look at the edges of the frame and check for stray objects that detract from the image. Check if your subject is merging with a background object. Is that a tree growing out of the top of his head? Change your angle. Move your subject. Use a wider aperture setting to blur the background. Arrange your subject and yourself so that unwanted elements are not in the frame. This might be as simple as a slight change in angle. Turn around and shoot in the opposite direction. Get the camera low and shoot upwards to avoid objects near the ground. Elevate yourself and shoot downwards to eliminate objects above you. If you can’t remove the unwanted objects at the time of capture, think of how you will crop the image in your image editing software later. Think of balancing your elements. Is your subject centered in the frame? Why? Try moving him to one side or the other, again by either moving the subject or moving the camera. Photos often look better when the main area of interest is a third of the way into the frame from any edge. 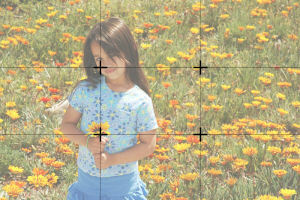 This is commonly called the “Rule of Thirds” and it is an old compositional technique that helps to create nicely balanced photos. That’s enough to chew on for now. 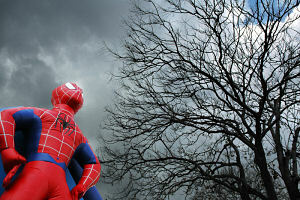 Just thinking about these things while you shoot can have a huge impact on how you make photos. Try them and I think you’ll be pleasantly surprised. And you’ll be well on your way to making photos that will have a real impact other than their sentimental value. Composition is a huge subject. In my next article about composition, we’ll delve into these basic concepts a little more deeply and add some more advanced knowledge and tips to your compositional repertoire.